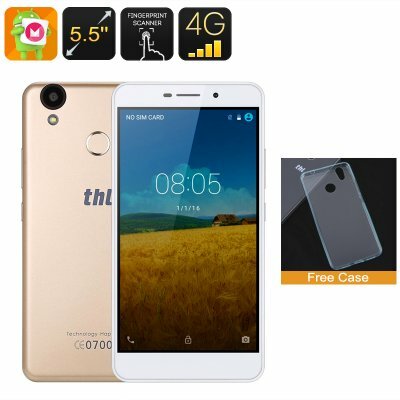 Successfully Added THL T9 Pro Smartphone - Dual-IMEI, 4G, Android 6.0, Fingerprint, 5.5 Inch HD Display, Quad-Core CPU, 2GB RAM (Gold) to your Shopping Cart. Are you looking for a cheap Android phone that features great specs and costs less than a hundred Dollars? Then search no further! Meet the THL T9, a highly affordable smartphone that packs sophisticated specs and runs on an Android 6.0 operating system. Letting you enjoy the latest software features, this Android phone brings along a smooth and efficient user experience. On its 5.5-Inch HD display, this mobile phone allows you to enjoy your favorite movies, games, and all its cool features in crisp HD resolution. Additionally, it packs a 3000mAh battery, bringing along a stunning 10 hours of continuous usage time. With this Android smartphone at your side, you’ll always have the means necessary to get through a media filled day and to stay in touch with friends and family without needing to worry about battery life. Featuring Dual-IMEI numbers, this mobile phone lets you be reachable on two phone numbers simultaneously – bringing along great efficiency for when traveling abroad or for separating your work and private life. 4G network support furthermore increases your overall connectivity significantly. Download files in the blink of an eye and browse the web at lightning speeds. No matter where you’re at, with this Android phone you’ll never have to feel bothered by a slow internet connection again. Within its sleek body, this budget smartphone packs a Quad-Core CPU and 2GB of RAM. Whether you like to play games, watch movies, or enjoy the latest Android applications – nothing is too much for this cheap phone. With 16GB of internal memory and a 128GB SD card slot, it offers plenty of space for you to store your games, media, and pictures snapped with the phone’s beautiful 8MP rear camera. Besides its 8MP camera that lets you snap beautiful photographs, the rear of this smartphone furthermore packs an ultra-fast fingerprint scanner. No longer will there be the need to remember passwords or complicated unlocking patterns. With the THL T9 Pro, all your personal files, games, and more will be accessible with the simple touch of a finger. No matter your smartphone demands, this affordable Android phone is sure to put a smile on your face. Perfect for anybody out there that’s looking for a powerful phone that comes with an affordable price tag – the THL T9 Pro is guaranteed to meet anybody’s liking. This THL T9 Pro Android phone comes with a 12 months warranty, brought to you by the leader in electronic devices as well as wholesale electronic gadgets..
Arabic: - 5.5 بوصة الميزانية الذكي - Chinese Simplified: - 5.5 英寸预算智能手机 - Czech: - 5,5 palců rozpočtu Smartphone - Dutch: - 5.5 inch Budget Smartphone - French: - Smartphone de Budget de 5,5 pouces - German: - 5.5 Zoll-Budget-Smartphone - Hebrew: - 5.5 אינטש תקציב החכם - Hindi: - 5.5 इंच बजट स्मार्टफोन - Hungarian: - 5,5 hüvelyk olcsó okostelefon - Italian: - 5,5 pollici Budget Smartphone - Japanese: - 5.5 インチ予算スマート フォン - Korean: - 5.5 인치 예산 스마트폰 - Malay: - Telefon pintar bajet 5.5 inci - Norwegian Bokmål: - 5.5 tommers budsjett Smartphone - Romanian: - Smartphone de buget 5,5 inch - Russian: - 5.5 дюймовый бюджетный смартфон - Spanish: - 5,5 pulgadas presupuesto Smartphone - Thai: - สมาร์ทโฟนประมาณ 5.5 นิ้ว - Turkish: - 5,5 inç bütçe Smartphone - Vietnamese: - Điện thoại thông minh 5,5 inch ngân sách.